Soon at Ligne Roset Réaumur showroom in Paris, Miss Marble is designed by Fabien Dumas. By virtue of its simplicity, Miss Marble already has all the ingredients of a great classic. What gives it real presence is the minimalist yet qualitative use of materials – a circular base on which rests a marble parallelepiped counter-weight, a bent tube supporting the shade, a domed half-sphere which may be angled to diffuse the light – and the purity of its immaculate white design. This minimalism does not preclude an eye for detail (elegant black and white woven textile cable) or a preoccupation with ecology (low-consumption LED bulb), both constants with this designer, whose fairly infrequent productions always aim for the very essential. 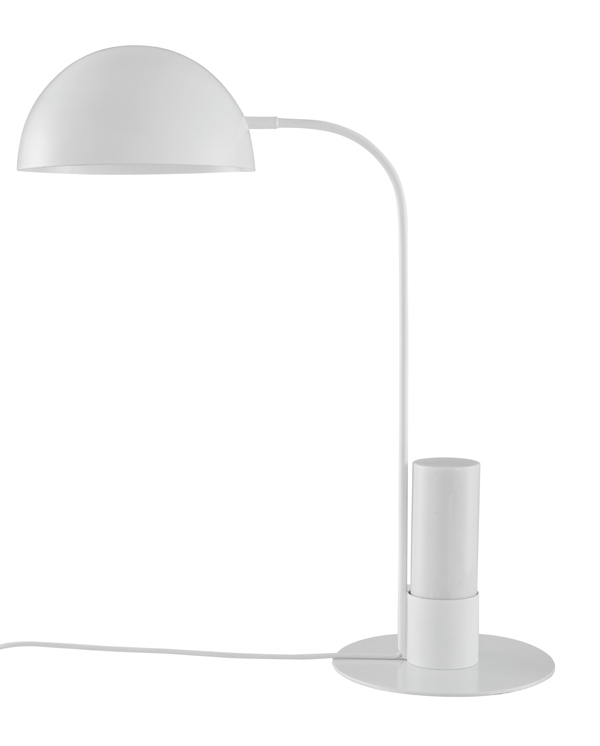 Table lamp with structure in satin white lacquered steel. Diameter of base 26 cm. White marble counter-weight. Half-spherical shade in repoussé steel turns on its axis 340°. Porcelain bulb holder. Black and white textile cable. Black manual switch. 12 W E 27 LED bulb. Colour temperature 3000 K (warm white).